Nice specimen, but this is a Dario dario, many shops probably still just call Badis. btw it is not a characin, so I moved it. I love to keep this and even managed to breed but no luck on the eggs. I know someone who breeds them succesfully, if you need help with the eggs just let me know and I'll give you some advice? I have bred them before. Just leave them alone with plenty of moss, plenty of live food (I used tubifex) and they will do their business. I didn't even need to do any additional special and I even had a trio of Rasbora dorsiocellata together in the tank. Left them alone for a week or less, and found lots of fries in the tank. Removed the fishes, leaving the fries in the tank. Unfortunately, most of the fries did not survive as I didn't have much time with them and suspected in breeding. Last edited by Quixotic; 11th Sep 2006 at 15:48.
hey guys, can enlighten me how to see male and female? i considering of buying a pair of it for my nano tank. female has hardly any colours. Just to expand, those with dark vertical bars across sides are males. Females have indistinct vertical bars, in fact, most don't even show any bars. However, sub-adults or juvenile males may be mistaken for females as their bars are not as distinct when growing up. So do not be surprised if perceived "females" turn out to be males instead. Again, most of them do not take dry food, feed live/frozen food. thanks for eveyone's input. Frozen brineshrimp can? C328 have it right? i saw yesterday, inside a small plastic tank on the floor. 2 males(from what i see here, vertical bars) and one dead male, so i didn't want to buy it. Is it a expensive fish? Last edited by Justikanz; 28th Sep 2006 at 17:46. Reason: Please avoid using SMS shortforms, thank you! Last edited by Justikanz; 28th Sep 2006 at 17:47.
thanks for evey1's input. Frozen BShrimp can? C328 have it rite? i saw yesterday, inside a small plastic tank on the floor. 2 males(frm what i see here, vertical bars) and one dead male, so i din wanna buy it. Frozen BS is okay but some can be quite picky. Food that they take readily are frozen bloodworm (smaller ones), live tubifex and live BBS. Those should be the ones. It should be affordable (they are mostly farm bred) but depending on your definition of expensive fish. If they don't look too thin, perhaps they are eating *something*. Just observe them from time to time, to ensure they are in good health. I have had some D. dario that refuse even live food, and only showed signs of emaciation after only a month or two later. Needless to say, they pass on eventually. BTW, is there some website about them? i want to see different types of dario before i buy anything. Last edited by Justikanz; 28th Sep 2006 at 17:50. Reason: Please do not use SMS short forms. And avoid excessive quotation. Thanks. I do agree that inorder to breed successfully, especially eggs scatters, one need to have a tank as messy as possible. The Cardinal Tetra in my tank use to bred quite regularly when I have a messy bunch of Java moss about the size of a basketball in one of the corner. My wife commented that I should make my tank more neat for them, and they stop breeding totally after i remove the chunks(either that or the eggs/fry got eaten before I even have chance to spot them). how big does it grows to at most?? Can i keep them with Apistos? Last edited by Justikanz; 29th Sep 2006 at 10:48. There are currently 3 described species in the Dario genus: D. dario, D. dayingensis and D. hysginon. They are all small fishes, reaching about +-2.5cm in size. D. dario comes from India, D. dayingensis from China and D. hysginon from Myanmar. D. dario is most recognisable by their vertical bars and found in our LFS quite often. However, they are known as Scarlet badis or Badis badis in the trade. Badis badis is actually a different fish, which is much bigger. D. dayingensis and D. hysginon looks quite similar, entire body is red with black blotches on the dorsal and ventral fins. They are rarely found in our LFS. Here is a picture of MrTree's D. dario. And here, MrTree shows you where D. dayingensis can be found, although I think that MrTree has removed the picture of D. dayingensis. There is possibly a fourth undescribed Dario sp. that came to our shores recently. A recent discussion of the fish here, Dario hysginon and Dario sp..
And finally, Alexander Dorn's webpages of Dario spp. Apistos can be quite agressive and territorial. 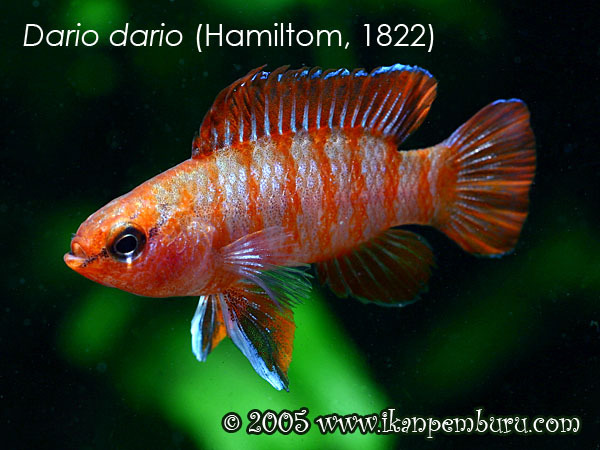 D. dario are rather slow fishes and easily outcompeted when it comes to feeding. I do not recommend this. They would do well with smaller and less boisterous fishes, e.g the smaller Parambassis spp., Boraras spp. Also, they are found in slow streams with lots of vegetation and plants, so they do not like current very much. Edit: Oh yeah, lest I forget, there is an article on Badis and Dario in PFK magazine, Oct 2006 issue, written by Anti Vuorella (whose website I posted above) and Stefan van der Voort, who is active in the other forum and successfully bred a number of Badis spp. Last edited by Quixotic; 29th Sep 2006 at 02:23. All times are GMT +8. The time now is 17:24.